Stomach pain occurs when the mucosal cells in the stomach lining get irritated or inflamed. Stomach pain is caused due to defective functioning of the stomach and indigestion. The Apple cider vinegar increases the acidity of your stomach, which helps your body to create more pepsin that breakdown the protein and improves digestion. The acids in apple cider vinegar help to decrease starch digestion. Apple cider vinegar allows the starch to get to the intestines and keep the bacteria in the gut healthy. The acidic quality of vinegar also flushes out the toxins from the body and maintains the balance of acid in the stomach. Apple cider vinegar also contains the concentration of pectin which soothes the irritated stomach. The anti-inflammatory properties of chamomile relax the muscles of your stomach, which help to move the food through the intestine smoothly. Chamomile also decreases cramping in the inner lining of the stomach, helps you to release unnecessary gas and swelling in the digestive tract. Drinking chamomile tea raises your glycine levels in the body, which relaxes your muscles and reduces the intensity of muscle spasms. The antioxidant and sedative properties present in chamomile tea help to calm your nerve down and relax your whole body. The volatile oil in fennel seeds helps to improve the digestive function by increasing the secretion of digestive and gastric juices. The volatile oil also decreases inflammation of the stomach and provides relief from stomach pain. The aspartic acid in fennel seeds works as anti-flatulent and helps in relieving the excess gas from the stomach thus preventing abdominal pain and stomach cramps. The antibacterial and disinfectant qualities of fennel seeds also help improve the functionality of the digestive system and cure diarrhea caused by indigestion. The anti-inflammatory properties of ginger increase the secretion of digestive juices, which helps to digest the food properly. The digestive juices also neutralize stomach acids and reduce stomach pain. Gingerols and shogaols present in the ginger help to speed up stomach contractions. The antifungal and antibacterial properties of ginger remove the extra gas from the intestinal tract, which helps to pass the food smoothly through the digestive tract. Peppermint has an antispasmodic effect on the muscles of the digestive tract which helps relieve pain caused by gas. The menthol in peppermint leaves acts as a natural analgesic or pain reliever. The herb present in peppermint soothes the stomach muscles and improves the flow of bile, which helps to prevent stomach cramps and bloating. Peppermint oil is also used in several over the counter medicines like Gas-X and capsules for irritable bowel syndrome. The probiotic properties of yogurt boost your immune system and thus provide instant relief from stomach pain. The live bacteria, Lactobacillus and Bifidobacterium in yogurt increase the good bacteria in the gut, which helps in digestion and reduce swelling or stomach pain. The digestive and carminative properties make caraway seeds useful for stomach pain. Caraway seeds are full of vitamins and minerals and acts as an intestinal diuretic. The anti-inflammatory properties of caraway seeds help in treating cramps and stomach spasms. Papaya contains enzymes called papain and chymopapain help to break down the proteins and thereby improve the digestive function. Papaya is also helpful for regularizing the bowel movement and controls the acidity level in the stomach, thus prevents stomach pain and results in easy digestion of food. Lemon contains Vitamin C which helps flush out the toxins from the body. The acidic properties of lemon help to promote regular bowel movements. Lemon juice has a high level of acidity which helps increase the production of stomach acids. These acids break down the consumed food, moving the food smoothly through the digestive tract and improve digestion. Rice acts as a demulcent which reduces the inflammation and works as a protective barrier by lining the stomach. The starch and bland-tasting rice offer a soothing effect on the irritated stomach caused by vomiting or diarrhea. Allow the mix to steep for 15 to 20 minutes. 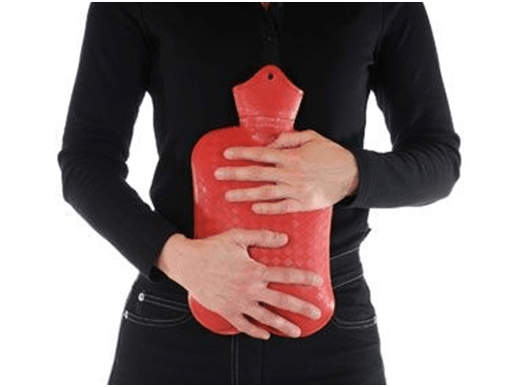 The warmth of the heating pad can help to ease tense muscles in the abdomen, helping you to overcome the discomfort of stomach upset and get back to normal. The heat also increases the blood circulation to the skin surface and transfers the pain from inside your stomach to the outside. Charging for 5-15 minutes , warm for 1-3 hours / Runs on electricity no hassles of heating water on gas or heaters. It is a high quality reliever from aches in cold climatic conditions; Gives relief from pain and makes you feel comfortable. You can keep it inside the quilt to heat up the quilt or use on low temperature for massaging body parts. A very useful product for the winters. An electric hot water pouch is a pouch filled and sealed with special gel, used to provide warmth, typically whilst in bed, but also for the application of heat to a specific part of the body. The 11 home remedies recommend above are very helpful during intermittent stomach pain which lasts for 2-3 hours. Despite undertaking the home remedies, if your stomach pain does not improve within 24 to 48 hours or lasts more than a week or longer than consult the doctor immediately.